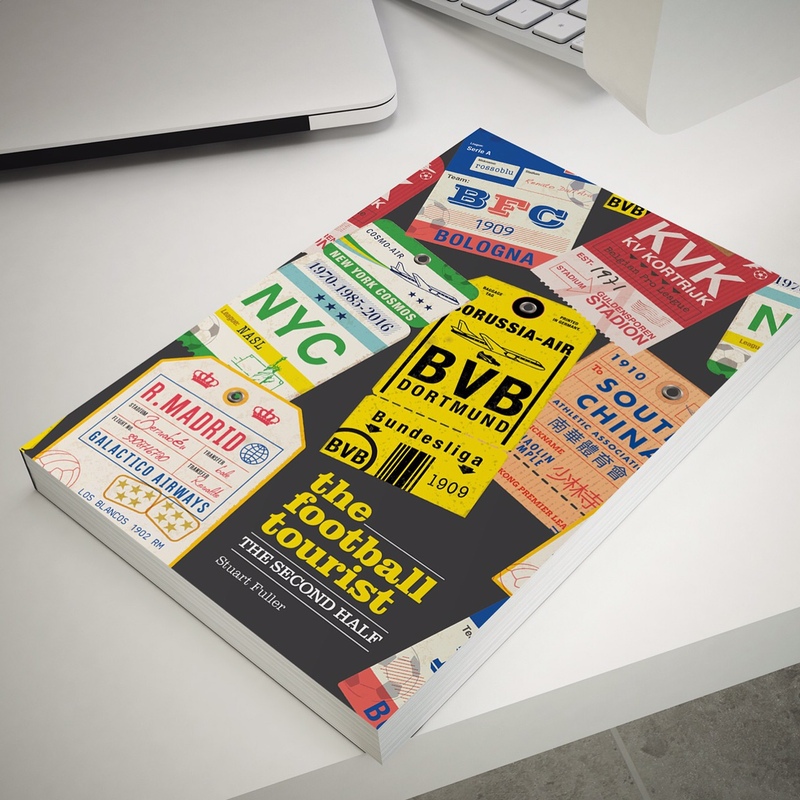 Brian Parish brings us a familiar story on a European success from Craven Cottage. After a 3-0 aggregate win in the first round against NSI Runavik, Fulham were rewarded with a slightly shorter journey just across the Irish Sea last week to play the first leg of their second qualifying round tie against Crusaders. A 3-1 win in Northern Ireland meant that they should have one foot in the next round, but you never can be sure about what will happen in these games. Dagenham Dan reckons that they were already through, but I was urging on a bit of caution. Crusaders were formed in 1898, but were not elected to the senior Irish League until 1949, when Belfast Celtic withdrew from the competition. According to the club’s history, in the early years players paid for the privilege of playing; if you didn’t have the required two pence, then you didn’t play, and this was strictly enforced. Northern Irish champions on four occasions (most recently in 1997), they have also won the Irish Cup three times, the last of these coming just two years ago when they beat Cliftonville 1-0. Last season they were runners up in both the League and Cup (both to Linfield), and qualified for the Europa League as a result. Given a bye from the first round, they were looking to extend their run in Europe this season. Fulham had been busy in transfer market over the last week or two. One of the arrivals was the former Liverpool defender John Arne Riise, who joined the club from Roma. He was soon joined by Marcel Gecov, who played for the Czech Republic against England in the recent European U21 Championships. Riise was expected to make his debut tonight, but Gecov has to wait a few more days before his first game. Although there are two new players joining the club, one has also left; Jonathon Greening has joined Nottingham Forest after two years at the club. There was a healthy turn out from Northern Ireland, and their journey was nearly rewarded within the first couple of minutes, when Stuart Dallas shot just over the crossbar of Schwarzer’s goal. This brought an audible sigh of relief from the home fans around us, who were clearly expecting Fulham to win handsomely. It took eight minutes before they could muster a shot on goal, but Johnson’s effort was straight at the keeper. Crusaders started in a lively fashion, and made the first ten minutes a bit more difficult for Fulham than may have been expected. Unfortunately for the Irish side, it didn’t last. Within five minutes, Fulham were getting on top, and were first to every loose ball. Crusaders were being hampered by their (at times) wayward passing, and they were just being picked off every time. Hangeland had a header straight at the keeper, and it was looking as though it was just a matter of time before the first goal was scored. We didn’t have to wait long, and it involved new signing Riise. From the half way line, Hangeland played an excellent diagonal ball out to Riise, who advanced down the left wing. He took a couple of touches, and moved to the side of the area, where he crossed into the middle; Zamora ran over the ball, taking a defender with him to leave Johnson almost alone in the middle of the goal. He controlled the ball before lashing it past the stranded O’Neill in the Crusaders goal. It’s a really well worked goal, and provided the breakthrough that the home supporters were clearly expecting sooner. For the remainder of the half, it’s almost one way traffic. There is the occasional burst from Crusaders, but mostly it’s Fulham doing the attacking. Senderos sent a headed chance wide (although he was fouling his marker), and Sidwell missed a couple of good chances, the second of which just before half time following a neat exchange of passes with Zamora. The only time that Crusaders got close is ten minutes before the break. Ciaran Gargan, who earlier had horribly sliced an attempted cross into the Hammersmith End, puts in an excellent ball to the area, where Timmy Adamson got to it just before the defender. Unfortunately for him though, his effort went over the bar, and with it, their last chance of the half. The second half started with the home side on the attack again. The rain which had fallen at the start of the evening has ceased, and the sun had turned the cottage in the corner of the ground orange. The first chance of the half fell to Sidwell, but his header was straight at the goalkeeper. Riise was looking very good on the left hand side, and combined well with the youngster in front of him, Matthew Briggs. Briggs is naturally a left back, but looked good going forward, and this could be a good partnership down this side for the club. Sidwell planted another header wide a few minutes later, this time from an inswinging Zamora cross. The chances were being created, but not being taken. 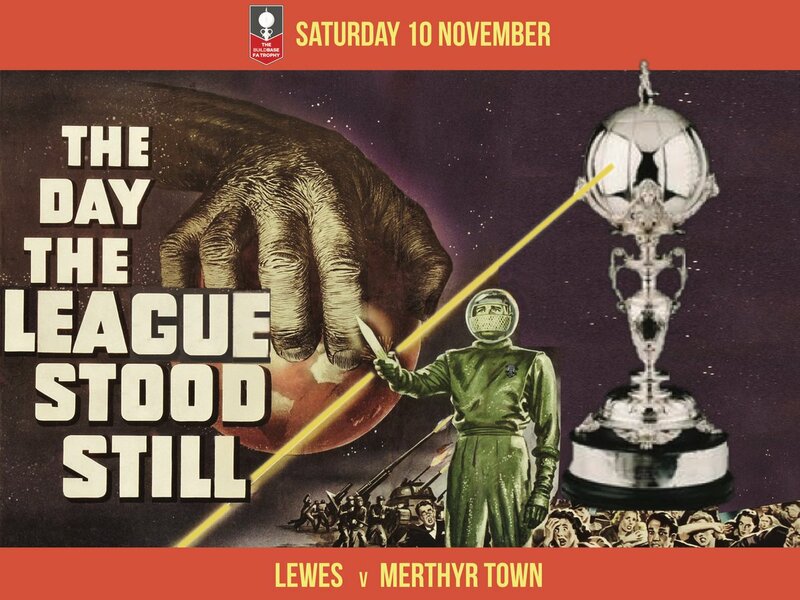 While that’s good from one point of view, it’s a worry that despite all of the possession and attempts at goal, it was still only 1-0. As if to spur the team on to greater heights, one person in the Riverside Stand helpfully shouted out to remind Fulham that “this lot are rubbish, you’re not playing Juventus”. Just to show that they may well have been listening, Fulham then had a burst of three goals in fifteen minutes to completely finish the tie off. First up is Damien Duff, just before an hour has been completed. Senderos plays him in through the inside right channel, and his shot across the goalkeeper into the net at the Hammersmith End was greeted with as much relief as the first. The third goal of the night is scored ten minutes later, and this time Zamora gets on the sheet. It’s another cross from the left wing (like the first), another dummy in the middle (like the first), and finished with a shot across O’Neill. The only difference is that the cross is supplied by Johnson, and the dummy is by Duff. The last goal of the evening arrived on 70 minutes, and finally Steve Sidwell was able to put the ball home with a header from a corner. He was able to celebrate his goal with the rest of the team, and that’s the last time we saw him, as he is immediately substituted by Dickson Etuhu. At the same time, Johnson was replaced by Kerim Frei, and over the last twenty minutes, we were treated to a promising display by the young Swiss player. With good quick feet and a decent turn of pace, he could be one to watch once he is in the team. The night was winding down, although not before Crusaders had their last attempt at goal; good passing between Adamson and Rainey results in Rainey shooting straight at Schwarzer. Dan reckons it would be good to see them score at least one, but it’s not to be. Every Crusaders substitution was warmly applauded by the home fans, as a sign of admiration for their effort on the pitch. 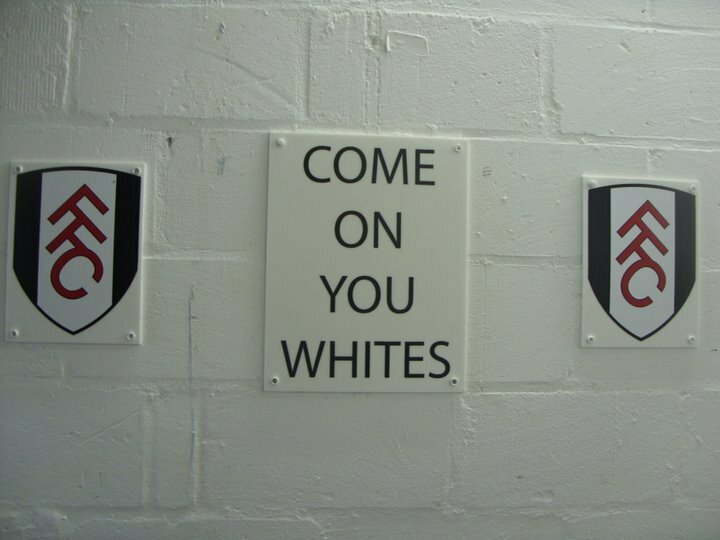 It’s just a shame that Fulham were just too good for them over the two games. 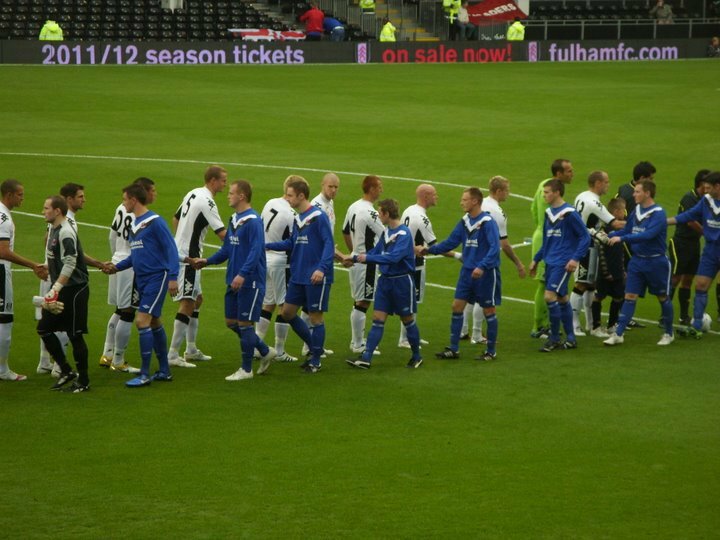 The last action of the night involved Riise being substituted by his younger brother, and while Fulham still pressed forward, they din’t trouble the scoreboard any more. Crusaders may have been beaten, but they put up a good display, and this was acknowledged at the end of the game, although obviously the home fans were more than pleased about their progress to the next round, and a trip to Split now beckons. 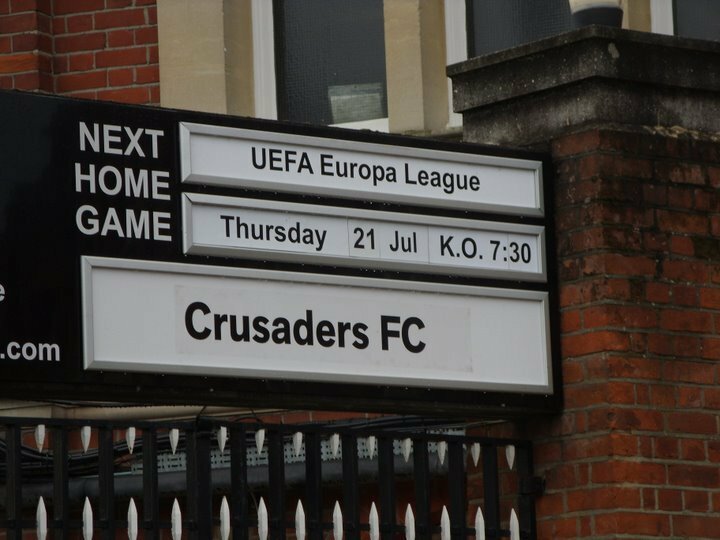 This entry was posted in European Football and tagged Craven Cottage, Crusaders, Europa League, Fulham. Bookmark the permalink.